Just before the trade deadline in 2003, my phone rang at my apartment in Dallas. I had signed as a free agent with the Texas Rangers during the offseason and the timing of the call raised my antennas. Just a half a year earlier, I had exercised my free agent option to leave the nest of the Philadelphia Phillies to pursue the best chance I had to remain a starter. Philly was my college town, the Phillies were the team of my childhood love, and it was also the organization that had given me the chance to be an everyday player. But I left as things in my life were unraveling. The Marlon Byrd era aged me out of a starting role, I was riding the decline of skills that come with passing your 32nd birthday, and the most devastating of all, my father had passed away the last day of the 2002 season, a day when I notched my 1000th hit. On the field, I was on fire in July (.389 batting average with a robust .925 OPS). Everything I hit fell for a hit, it seemed. This was also after I recovered from the first surgery of my life. A torn hamstring tendon from simply running from home to first in April caused me to miss six weeks. After a lengthy rehab assignment and limping around for a few weeks, I returned to the Rangers. Now I was leaving. This time of year marks the trade deadline. For the past few weeks, speculation flew around about who may go where, who a team needs to win it all, who a team can give up. We move the pawns around the chess table without a second thought. It’s fun. Will the Cubs trade for a new pitcher? Will they bring in a fourth outfielder? In 2003, that is exactly what they did. I was that fourth outfielder. Maybe even the fifth or sixth. Once I hung up the phone with the GM and it starting to sink in that I was a Cub again, I had mixed feelings. Some were downright feelings of mad frustration, some were of sadness, some were of the excitement of opportunity, some were of nostalgia. The 2003 Cubs were in a much better position than the 2003 Rangers. They had a real opportunity to make the postseason and if I was on that team, it would be for the first time in my career. It's worth noting that my career did not have much left in the tank. When you chart the map of a player’s career to the instant he is traded, we find that his road to that moment was never linear. It was never as simple as climbing the minor league ladder with guaranteed advancement. It was a complex highway, full of tolls, potholes, and surprise off ramps, even while being distracted by the breath-taking scenery. The hurt of this deal came from many directions. I had overcome a new hurdle in my life by returning from surgery to not only return to play, which was not a sure thing, but return to my best form. I was a starter again, after the Phillies no longer saw me in that light. It was redemption, it was perseverance, it was a restoration of my love of the game. I had made my money, which was part of the reason I rejected a better deal from the Phillies to go to Texas. I wanted to be a starter. So I committed to recovery because I wanted to play badly enough to come back and be better. Through ice packs, ultrasounds, MRIs, anesthesia and hope. It also reminded me of when I was first traded from the Cubs in 1997. It was the day after my grandfather had passed away in Rocky Mount, North Carolina. I felt empty that day and unable to clearly see that the Cubs were sending me an opportunity. I could only see the minor league road, full of hurdles that took me through a toxic relationship with a manager in Triple-A, to a glorious career turnaround in Winter Ball in Puerto Rico. I could not shake that my parent team had given up on me and I was and always had been a Chicago Cub, from the first moment the dream became reality. So why do they want me back now? This led to my next thought. Everywhere else I played, I was a starting centerfielder, but not in Chicago. In this trade, I was losing my starting job to be a role player behind Kenny Lofton on a .500 team. It was tough to not be a starter, but as tough was my envisioning my career ending after the season. Who would sign a 33-year-old role playing outfielder, who only plays against lefties and does not have power, who is missing a hamstring tendon? Once I accepted my new reality around the trade, I had to plan how I was going to get to Chicago. All of my belongings were in Dallas. So I planned to meet the Cubs in Chicago (for the homestand), then during an off day, I would go to Dallas, ship my vehicle, and return to the team. I can only imagine what this must have been like for players with families and kids. It was then time to say my good byes. As a Ranger, I had just played in my 1000th game, capped by a homerun off of Tim Wakefield the night before. Now I realized that no one had a real name. A-Rod, Juan-Gone, Playa, Raffy…. So I went to the stadium to get my baseball equipment and it was like I was a ghost. No one knew exactly what to say, I didn’t know what to really do, then I turned to my locker and all of my goods were packed in boxes. I then understood that there were protocols about employees and handling their departure. There was no trace of my existence in that locker. All the fan letters from the Good Grades Club, my jerseys were gone (which I had to buy back, by the way.) I had evaporated. The biggest box I carried was the loss of my father. I did not have his voice anymore to give me his pragmatic advice about how to move on. How he made it in America after coming from Trinidad with nothing but a suitcase full of his belongings. I went to Texas to start over. To bet on myself and re-establish that I was a starter. That circle of healing was tied to Texas as I rebelled from my Philly roots, my hair grew so long that 70s baseball icon and my new manager, Dusty Baker, told me that I had to either “braid it or cut it.” I had no plan for my hair, it was out of control and not a priority. My only plan was to just play. I arrived to Chicago frustrated on the bench, but uplifted by Baker’s positive energy. It did not take long to see this team was a bunch of veterans who had been starters just like me. It helped to see Eric Karros Tony Womack, Mark Grudzielanek, Tom Goodwin, Troy O’Leary, and Randall Simon. We all learned together how to platoon and be selfless. I bought in with hopes that we could do something special as a team. 2003 would be a memorable ride that I was thankful to have experienced, even when the season ended how it ended. My only playoff appearance, I had my moment in the sun in Game 3 of the NLCS and made the most of the few opportunities to play. The fans, as they have always been to me, were gracious and supportive. A player in a trade can be the piece of the puzzle that changes the future of an organization. Jesse Chavez could be that pitcher, just as anyone who is on the roster can be a hero come playoff time. I dare not insult any hero by calling him “unlikely,” because simply by being there, they are carrying a story. They have overcome. Inherently, they have a will, a commitment, a history that we may not see until we look. 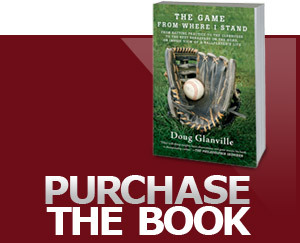 It is what makes up every player who has beat the odds and become a major leaguer. It is in these times of overnight change that we learn that a player is much more than a transaction. He may complete the puzzle, but the puzzle is a piece of his life.